There are two things everyone has in common: we all love Tom Hanks, and we all have insecurities. No one likes to admit it, but it’s hard to be confident in a world that seems eager to point out our failures. We’re impatient. We’re jealous. Some of us sit in our cars and cry while listening to Adele a little too often. If we all have insecurities, why is it still so embarrassing to admit them? We’re insecure about being insecure. Almost Already discusses our real life issues in an open and honest way. There’s no hiding behind cliché catchphrases and cheap life hacks. Through all of our shortcomings and frustrations, we can become who we were meant to be by knowing who we already are. Greetings! I live and work in Jacksonville, FL with my wife Brittany and my dog Walter. I don't take myself too seriously, but I really like to dive into deeper matters of what is going on in the world around me and figure out how it connects to what is going on inside of our minds and hearts. I've written my first book, "Unbalanced: Searching for Truth Between Religion and Culture (and Really Good Mexican Food)" which was released June 2016. 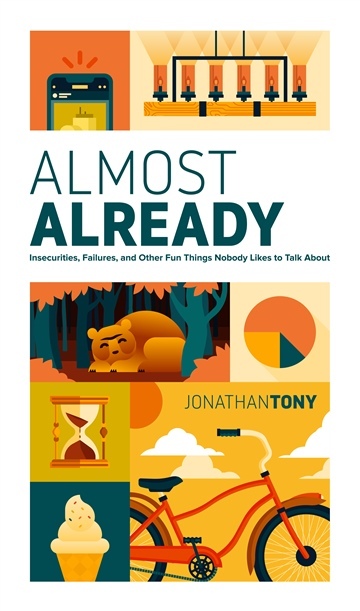 You can also check out more of my writing at JonathanTony.com.